Buy 3 or more Guides for Association Practitioners (GAPs) and save 20% off the member or non-member price! The discount will at during checkout. This guide will help you through what might otherwise be a tricky process. Contains criteria for selecting a management company, developing bid specifications, identifying the best candidates, sending out requests for proposals, meetings and interviewing candidates, and analyzing proposals. Also offers a section on working with your management company and sample management specifications. Community associations select management companies for a number of reasons. During a community's development stage, some developers may not believe a professional community manager is needed. When the board assumes full control of the association from the developer, board members may find they need to take this step themselves. Boards of self-managed communities may decide they'd be better served by a management company than volunteers. Or, a board may believe a change is needed from an existing management company to another. Whatever the reason, boards should understand the importance of selecting a management company and apply a well thought out selection process. 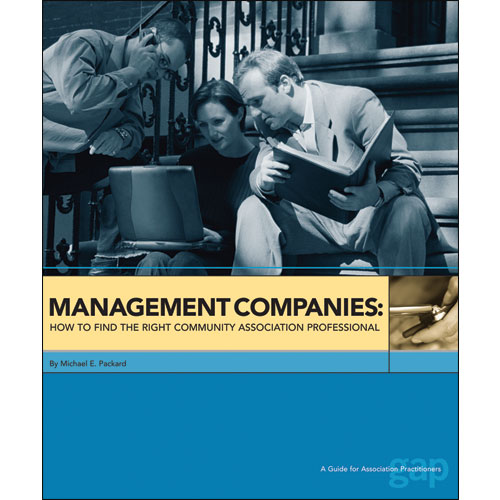 Association boards who may not appreciate the importance of professional community association management may hire a management company based on the wrong criteria, such as price alone. Or they may simply hire the first company they find under the mistaken assumption that all companies are more or less the same. Board members should select a management company that is a right fit for the community and not be reluctant to pay for quality services. The success of the community may depend on their selection. Boards should understand the important distinction between property management and community association management. Property management is an essential component of community association management, but professional association management is designed to support the board with the added governance component that is an integral part of community associations. This guide will help association boards understand how to identify their needs and select the management company that best meets them. Management companies can provide a number of services. Therefore, the association should specify exactly what it needs to ensure that companies bid on the same services.The board should determine which services can be handled by members, outside contractors, and on-site personnel before assigning tasks to a management company.The quality of services provided by a management company may be verified by contacting current clients, former clients, the Better Business Bureau, and state real estate agencies (where applicable).